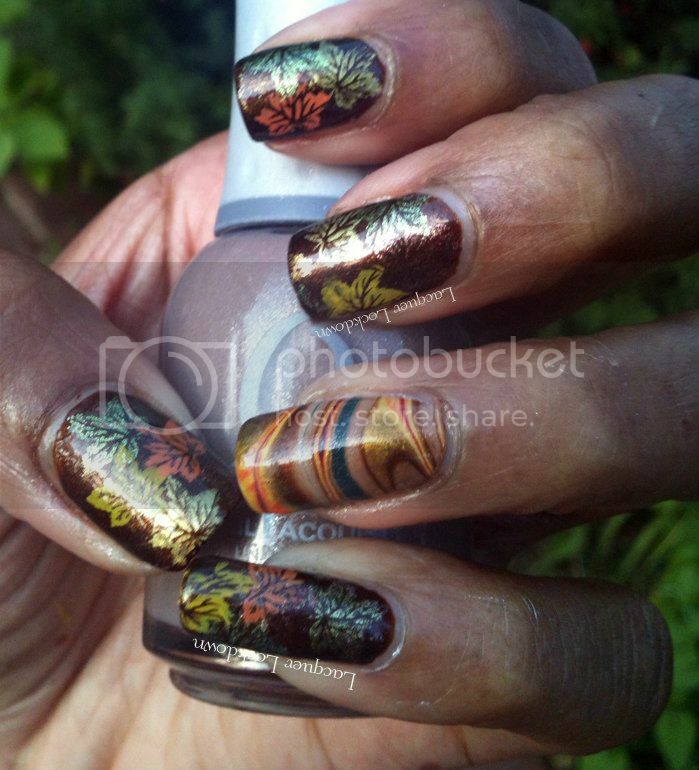 Lacquer Lockdown: Falling Leaves...On Sundays I Stamp! Falling Leaves...On Sundays I Stamp! Aigoo I am so behind schedule! Yesterday I had every intention to post up day 2 from the challenge, but I had an unexpected visit from my mum so that got blown to bits lol! 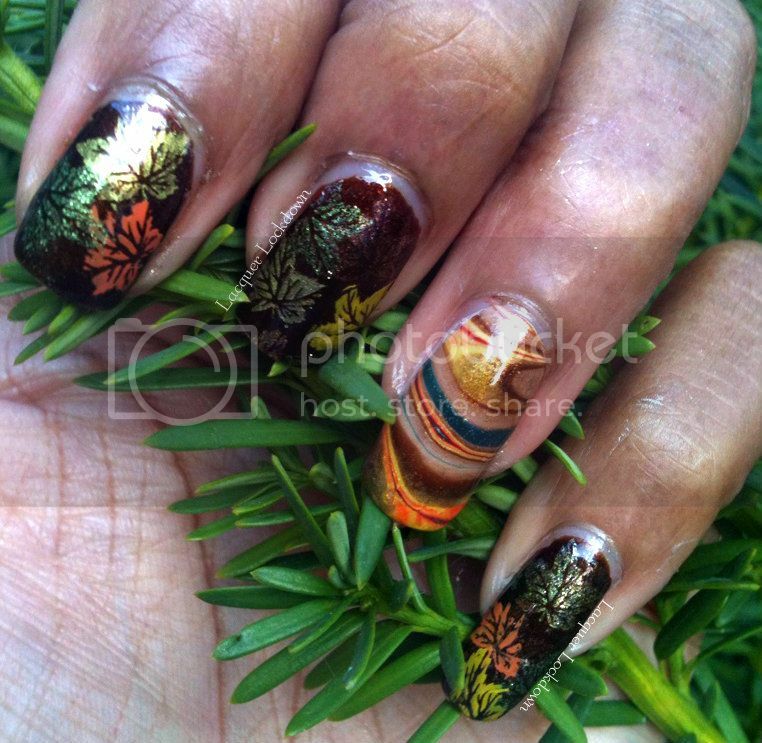 And today the AIS challenge for a Leafy mani almost stumped me. I've told my friend Vicky from Boombastic Nails that I still have fails 9 out of 10 times when I go to stamp and today it went exactly like that. I sort of realized these fails are the result of poor color choice, and so I'm going to be making an effort to make sure I put my stamping colors and base colors together with a bit more care in the future to prevent frustration when the colors don't show up as I've imagined them. Okay so enough rambling...let's get onto the art! Orly's Buried Alive...wait I have to do this and then I can talk about the color. "I shall leave you as you left me. Buried alive...buried alive." "Kaaaahhhhhhhhnnnnnn!!!! (echoes...echoes). LOL!!! I'm sorry I had to and yes I'm a huge dork! Anyway, Orly's Buried Alive looks like it should have debuted in the fall instead of the summer. It is so rich so rich I knew when I saw the theme for this weekend that it had to be the main color for the mani. And because I made this choice this is exactly why my first few attempts at this mani resulted in fails. It's so dark and beautiful holos and lighter colors, even my beloved cG Passion, got sucked into its depths and disappeared never to be seen or heard of again! It took me a while to realize metallics and foils were going to be the only type of finishes that would work on this polish. I ended up changing the base color of the water marble. Holy smokes right?!? So many freaking polishes! In my defense fall is very color rich and so even this amount of polishes doesn't quite cover the spectrum of all the beautiful colors that abound at this time of year. I love the shimmer exploding all over this mani! You may be asking why the water marble? Well it was a last minute decision. One of the things I love about marbles is that they very effectively capture the transitions of colors and fall is really all about transition. So what do you think? Even though this challenge pushed me and I had multiple fails I'm very happy with the final results. Thanks for reading and stay tuned for my vintage mani for day two of the LDTTW challenge! Toodles! This is gorgeous!! Yes yes yes you told me ... but you still figured it out though. I can't do this anymore ... Maybe one day I will get back into it when I get sick of glitter !!!! You really did a great job!!! BTW the SNA Halloween polishes aren't my first, I have 8 other ones. Yes her restock is crazy and you have to be REALLY quick!! Lol thanks! I knew you would say something positive despite my moaning and whining. Hahaha you will never get tired of glitter I think and since you are so good with the pairings why would you. Yeah after I wrote that comment I knew that was wrong I think we must have been talking about Sister Sparkle. I want it too!!!! i truly love it. it looks fab. your marble is unreal! your stamping looks pro! i would have never guessed you came anywhere near a fail! Wow thank you Vicki! That's a huge compliment m'dear. Lol the fails happen only I'm stubborn about trying to find a solution. I really almost gave up with this one it was tough! What a great autumn mani! I love the prints of leaves - they're such beautiful rich colours! Gorgeous!! Very earthy and fall appropriate! Wow I love the autumn leaves perfect for fall. What a great mani! 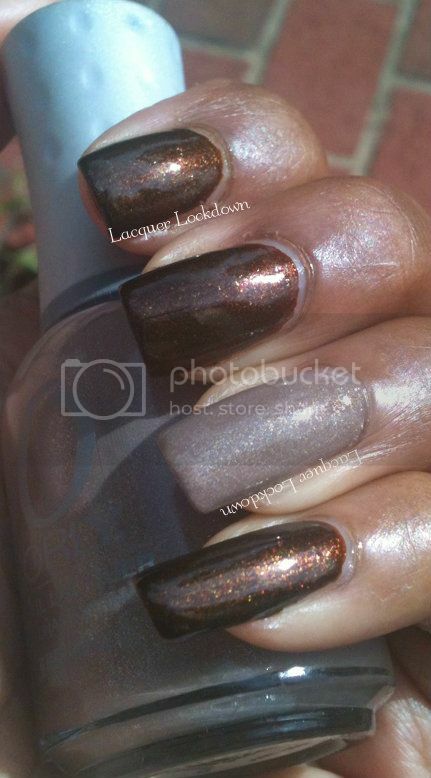 I love fall and everything related and this mani looks soooo beautiful! Aigoo LOL do U speak Korean? Thank you pudding pop! Yes I do although I'm learning and slowly adding words to my vocabulary and Japanese too :) I want to be fluent as I do plan on visiting that side of the world soon! I wouldn't call these fails! 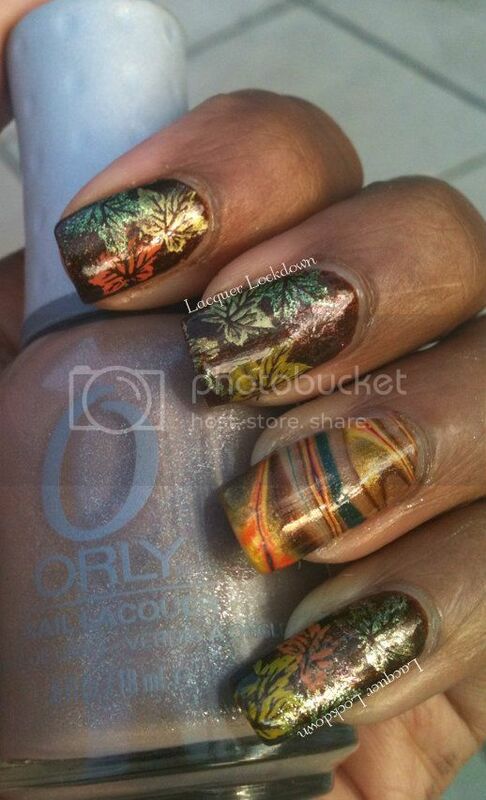 I really like your different colored leaf stamping! I think the colors look great together! Thank you! Lol - this mani isn't the fsil though it was when I was attempting to get to this that I failed over and over. The stamping wouldn't show up and things were bleeding into each other. I must have done it over about 4 or 5 times before I got to this which I'm very happy with! Chelsea's Choice...On Sunday's I Stamp! LDTTWC Day 2 - It's Vintage Darling! Toxic Rain - On Sundays I Stamp!